Among all accidents that occur on the road, being involved in a motorcycle accident can leave victims feeling scared and vulnerable, causing serious injuries or even death. If you or a loved one sustained injuries in a motorcycle accident, it is essential to contact the skilled Knoxville motorcycle accident attorneys at Greg Coleman Law for assistance. We are here help you pursue a legal claim for compensation and identify who is responsible for the accident. To help reduce your risk of a crash, consider the following tips for avoiding a motorcycle accident. Accidents often happen when motorists are unaware or observant of their vehicle’s blinds spots. Knowing where your blind spots are can help you lower your risk of a crash. Knowing where the blind spots are on other vehicles is also important to avoid a collision. When the driver is unable to see the biker in the mirror or out the window, the likelihood of an accident increases significantly. Passenger vehicles usually have blind spots to the left and right near the back where other vehicles are not visible in the mirrors. Large trucks have bigger blind spots in any area where the trucker cannot see other motorists in the mirror. Keeping a safe distance from other vehicles can give you more time to maneuver or slow down to avoid a potential accident. This often requires slowing down and changing lanes to ensure safety and to avoid collisions. Protective gear is crucial for safety on the roads. Proper safety gear includes a strong helmet that is approved by the Department of Safety to provide the best protection from serious head injuries. You could also wear a jacket and thick gloves to prevent burns and scrapes on the hands. Knee pads can help prevent damage to your knees in a crash and wearing brightly-colored gear can increase safety by making you more visible to other drivers. A biker has the option to use both electronic and hand signals. It is important to inform the drivers behind and beside you of your intent to make a turn. This also provides sufficient room to maneuver or to change lanes. Speeding increases the odds of being involved in an accident. Higher speeds often lead to injuries or death. Speeding on wet, icy and slippery roads should be avoided due to these dangerous conditions. Speeding reduces the amount of time you have to react to obstacles in your path. Motorcycles can easily crash when passing over gravel, railroad tracks or gaps in the asphalt. This is why you need to ride at an appropriate speed so you can see what is in front of you and you have time to maneuver. With regular repairs, you can help ensure your motorcycle runs smoothly. This will help you slow down and make other maneuvers that can help prevent a crash. Many motorcycle accidents are preventable. If you were injured in a motorcycle crash, it is important to consult with a Knoxville personal injury lawyer to determine if a claim for compensation may be viable. 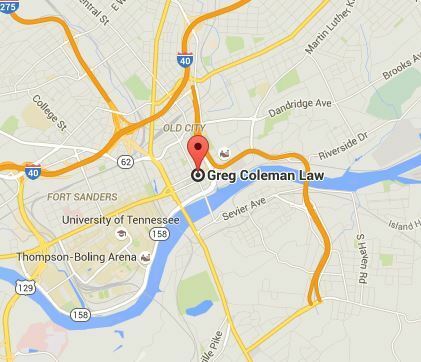 The capable legal team at Greg Coleman Law is ready to assist you with your accident claim. We can discuss the legal options open to you. We will evaluate your claim and customize a legal strategy according to your circumstances. A free, no-obligation consultation is available to you so we can learn more about your claim. Call (865) 247-0080 or fill out our Free Case Evaluation form now.